If you like to eat food and you like celebrating summer, then listen up! Wisconsin has some pretty fun festivals for the summer season with delicious eats you need to try. From cities to small towns, here’s our list of food festivals worth attending this summer. This free festival celebrates a staple to Wisconsin, cheese curds! Enjoy a wide variety of creative cheese curd dishes and sauces, using curds from Ellsworth Cooperative Creamery. Here’s a fun fact: Ellsworth Wisconsin is known as the “Cheese Curd Capital of Wisconsin”! More than 250 of the best local and midwest artists bring their masterpieces to this family-oriented free festival. Besides the enormous art fair, attendees can try some signature strawberry dishes at the Festival’s food court. From the “Original” Strawberry Brat to the Strawberry Chicken Wrap, and even Strawberry Shortcake, there are many locally made delicacies to enjoy at the Cedarburg Strawberry Festival. The whole family will enjoy heading out to Brat Days! There’s a brat eating contest, cake eating contest, parade, live entertainment, marketplace, brat trot, and carnival! If you’re of the legal drinking age, be sure to visit the many beer tents, cantinas, and the beer trailer. Brat Days is Sheboygan’s Largest Annual Fundraising Event with proceeds going to local non-profit organizations! Since 1851, the Wisconsin State Fair has been entertaining families during an 11 day period near the end of each summer! Once you have your ticket inside, enjoy multiple FREE entertainment stages, some of the best deep-fried food (like the famous cream puff) as well as many great attractions, games, and activities for the whole family! Be sure to check out all of the great vendors inside the Exposition Center! The first Sunday of every August, Cookie Daze commemorates Ripon, Wisconsin as Cookie Town USA! This festival features cookie decorating, a cookie hunt, kookie cookie bingo, face painting, and many other great children’s activities. Don’t miss your opportunity too get a photo-op with the Cookie Monster! Enjoy the “King of Condiments” at this annual family-friendly festival with live music, hot dogs, brats, and FREE mustard sampling. Culver’s Frozen Custard will be serving Mustard Custard for those who are adventurous enough. Just be sure not to ask for ketchup at this event or you may be asked to leave! (We’re totally kidding). Experience a weekend full of free entertainment and good eats at the annual Taste of Madison on the Capitol Square. Taste little bites from all of the great restaurants, cafes, and food stores, around “Mad City”. Plus, there’s no charge for admission or entertainment. 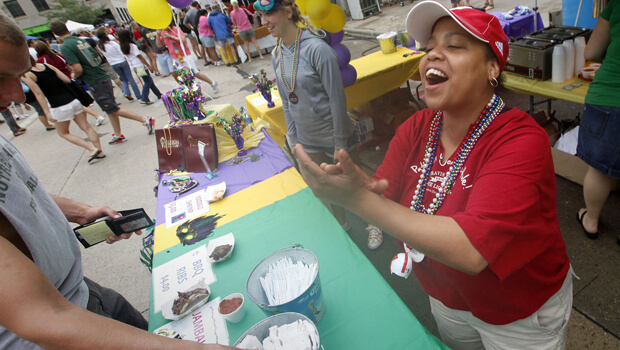 Taste of Madison benefits more than 50 local charities & non-profit organizations. Enjoy 2 days of “Porktacular” activities that celebrate everything Bacon! This festival features a cook-off competition, great live music, and pig-themed activities for the entire family. Be sure to take home some pig-themed merchandise from local artists. Also known as “Cranfest”, the Warrens Cranberry Festival is actually a non-profit organization that benefits the community of Warrens, Wisconsin. This year is the 45th year of the festival and includes great shopping, a parade, many contests, marsh tours, and tons of delicious food! Make your plans now to visit for the weekend and eat as many cranberries as your heart desires!